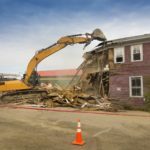 The most common form of demolition we are called for is the tearing down of a home to prepare for the construction of a new home. 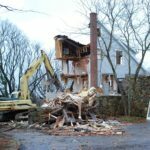 If you have bought a lot with an existing home that needs to be removed, we can work with you to not only remove the old home properly, but work with you all the way through to the finished landscaping of your new home. Have you ever been involved in a home improvement or renovation project? We can call agree that the mess and clutter is the worst aspect of any of these projects. This issue is even worse when it comes to the demolition of an old building. However, taking the time and care to keep it all under control is the key to an efficient and seamless demolition. 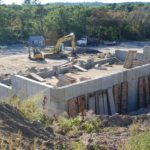 We use our fleet of trucks and excavators as well as dumpsters to achieve this. The demolition of any structure requires a building permit. 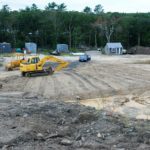 The type of building and location may require additional town departments to be involved, but a building permit is required at the minimum. 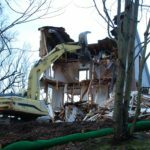 Contact Sheridan Landscaping for a free estimate on our demolition services at (774) 413-5012 or fill our contact form to get immediate assistance.